PC gamers searching for a little more power than the WindForce OC variant graphics card released by Gigabyte last week. 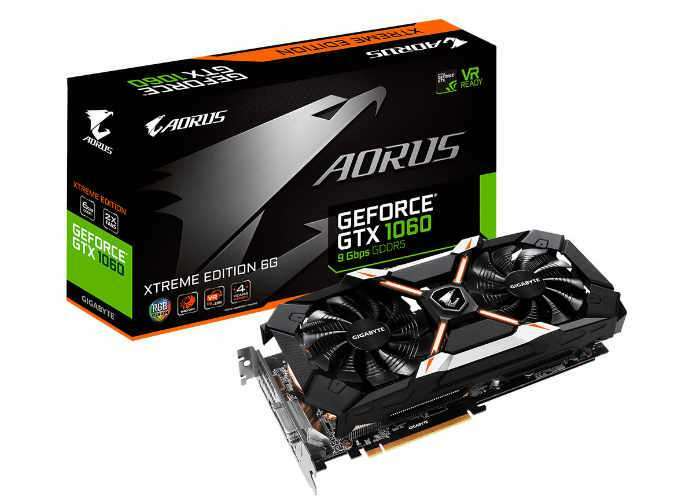 The new Gigabyte Aorus GeForce GTX 1060 6GB Xtreme Edition graphics card with 9 Gbps of memory might be worth more investigation. The Gigabyte GV-N1060AORUS X-6GD model has now been unveiled and includes triple-slot, dual-fan cooler that features the signature X-shaped lighting ornament on the cooler shroud, sitting between the two 100 mm fans, together with an aluminium fin dual-stack heatsink. The Xtreme Edition is positioned a notch above the card GIGABYTE launched last week, in featuring higher factory-overclocked speeds of 1620 MHz core, 1847 MHz GPU Boost, and an untouched 9026 MHz (GDDR5-effective) memory clock, against 1607/1835 MHz (core/boost) of the WindForce 3X, and 1506/1709/8008 MHz (core/boost/memory) NVIDIA-reference clocks. The card draws power from a single 8-pin PCIe connector, display outputs include three DisplayPort 1.4, and one each of HDMI 2.0b and dual-link DVI. The company didn’t reveal pricing.